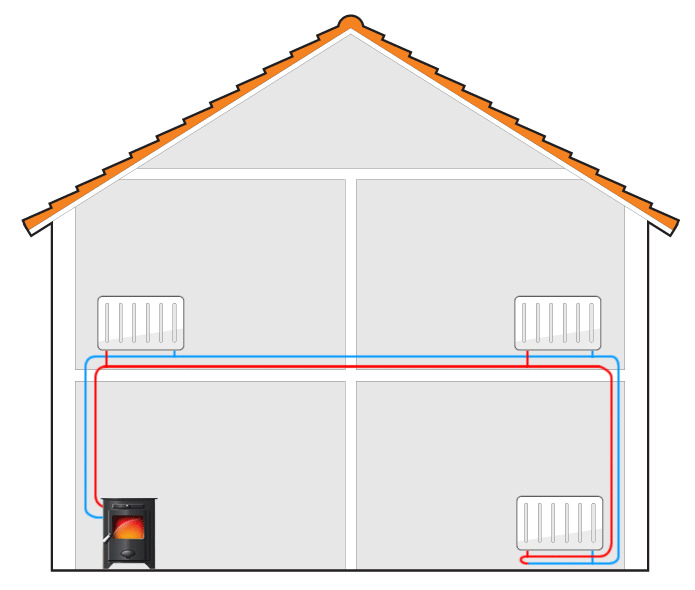 Central heating relies on a circuit of warm water which is run through your house into each room that will need heating. The water is not run directly through each radiator - otherwise there would be no way or regulating or 'balancing' how hot each radiator gets, and you would end up with the first radiator in the system being very hot and the last one cool. It is a good idea to get an idea in your head of how the pipes actually run - you do not have to know this really (your heating engineer will take all this in their stride), but it will help give you an idea of how a heating system works, and will give you a better understanding of the diagrams on this site. Imagine that your heating circuit is laid out infront of you. You have a hot water pipe that runs from your stove (or other heating device such as a gas boiler), around your house to each room that needs heat. At the furthest point the pipe then turns back and follows itself back all the way to the stove again. So you have two pipes running next to each other through your house, one taking warm water away from your stove, the other taking the cooler water back to your stove to be reheated. The hot water pipe going from your wood boiler stove (the red one) is called the FLOW, the colder water pipe coming back again (the blue one) is called the RETURN. Radiators are joined to this loop through tee pieces - a pipe lets hot water in to the radiator from the FLOW and another pipe runs back to the RETURN. There are usually adjustable valves on the pipes running to and from the radiator. The valve on the flow (hot water pipe) usually has a comfortable handle and is the one you use to adjust the radiator day to day, the valve on the return (cooler water) is usually adjusted with a spanner and is what lets you 'balance' the heating system.